Dave Kehnast has lost everything a few times. He battled heroin, was spiritually reborn, then created a job that he quit so he could then create a business. Dave quit his corporate job in 2010, during the middle of a recession, though he was advised not to. He felt he had to follow his heart – he knew there was something more than the 9-5. He also knew he could accomplish anything after what he’d conquered in overcoming addiction. Surfing has also been a HUGE part of it all, and is the impetus behind his latest move from Chicago to California. Not only a surfer, he’s a skater, and an ontological and spiritual warrior. Dave is a graduate of the 2011 Chicago Accomplishment Coaching Coach Training Program. Accomplishment Coaching is committed to excellence in all of the coaches it trains and in the ontological, being-based, methodology it uses. Following graduation, he progressed on the leadership track for an additional three years, coaching and mentoring upcoming coaches and leaders. Dave was trained under Master Certified Coaches, one who was instrumental in founding the International Coaching Federation. Currently, Dave has accumulated over 2000 hours towards Master Certification through the ICF. Dave’s vision for the future is to start interviewing fascinating people who lead fascinating lives. He’s committed to coaching people towards “impossible” futures for themselves. 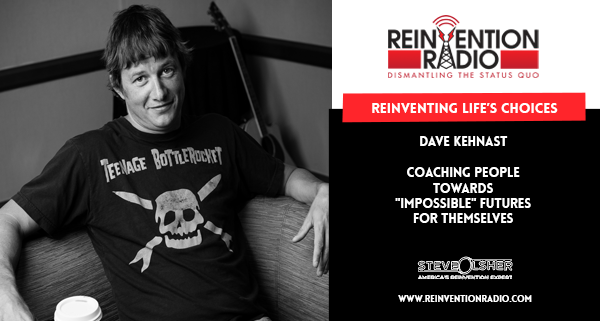 TUNE IN to this episode as Dave chats with Steve and Richard about life’s choices, and coaching people towards “impossible” futures for themselves. Reinventing Sushi – In this episode, Eiji Morishita chats with Steve, Mary and Richard chat about his family, and how he helps empower leaders to start movements that impact millions of lives.